My father spent part of his WWII service in Northern Italy and Egypt. Not only did the war change him, but the beauty within these countries transformed a young soldier into a man who'd forever appreciate opera and history. This meant that as children we grew up listening to Jussi Bjorling, Maria Callas, Kiri Te Kanawa–often against our will, but we never grew bored with my father's tales of entering the great tombs in Egypt, of breathing in the pyramids on the outskirts of Cairo. If my father were alive today, he'd be following all of the updates on the present tragedy ensuing in Egypt. He'd help me understand the complexity of it all-the difference between a revolution and a coup, between the military police, the Muslim Brotherhood and other Salafi groups, between pro and anti-Morsi groups, and the reasons why America continually "gets it wrong" when it comes to Middle Eastern politics. He would also mourn the loss of Egyptian lives. Many of those dead are Christian. Many Coptic Christians have been murdered and their churches destroyed. Many Brotherhood members have killed and been killed. Many police and security force members have died. And many innocent bystanders, as is often in civil unrest, have been murdered and maimed. In a country of 84 million people, with unreliable and conflicting reports, it's very hard to accurately depict the casualties. Collectively, the numbers are unimportant. Individually, mothers, fathers, sons, daughters, children, friends, all mourn their losses over the past weeks. It’s easy for us to forget those mourning, especially when they’re far away in another country, with different politics, different religions, different values. It’s easy to watch the violence on CNN and then to quickly flip over to whatever inane show that’ll numb us to the sadness in the world, and reinforce the security that we are not THEM. We are not wading through sacred Mosques, now makeshift morgues, in the hope that we won’t find our missing father/son/brother. We need not be concerned for such tragedies happening beyond our control, in places where we can’t speak their language or recognize the familiar. We may not be Egyptians, but we are, collectively, human. We all mourn the loss of our loved ones, no matter what faith or tradition we embrace. We all weep and are forever changed when faced with loss. We are never the same after loss, never. Several of my FB friends are Egyptian. All of them are grieving. Their grief is fresh. It’s the numbing, confusing, dizzying grief that hits first. Everything is raw, primal. It’s compounded by the suddenness. It’s compounded by the silence–the silence of fellow humans who don’t acknowledge their loss, their grief. It’s as if their loss doesn’t matter. Their grief is not going away anytime soon; in fact, it’ll never go away completely. 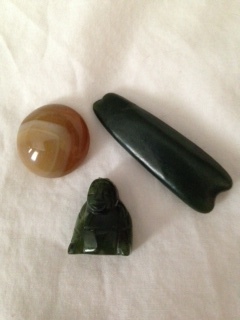 When my father died suddenly and unexpectedly, I was only 20 years old, and yet I still carry around a small velvet bag containing his memories-the pictures in this post –a piece of greenstone he found on the beach at Russell, NZ, where he lived as a small boy; a lucky stone that he collected along life’s path; and a jade Buddha that he wore around his neck for the last decade of his life. When I saw my father’s dead body, after the emergency crew had furiously tried to revive him following a massive coronary, there were two memories I carried forth from that moment on: his torso was black, purple, colorfully bruised form the attempts to revive him, and his little Buddha and greenstone lay peacefully, still, on a silver chain around his neck. Ironic, perhaps, that such peaceful symbolism had witnessed such a violent death. His death, a mirror image of his life. But that’s another post. Although decades have passed since my father’s death, from time-to-time I take out these small relics. I relish their feel-cold, smooth, and still brightly colored. Then I’m transported back to an ER, to the phone call that changed my life forever, to the country of my birth, to my family home on Puhinui Road, and to all the beautiful and tragic memories of my father. There is no amount of time that’ll ever erase these memories. Nothing that’ll ever make me forget him, or love him less. Grief’s like that. It lingers. It softens around the edges, and yet remains fiercely attached to us forever. In this, we are all the same; there is no “them.” All over Egypt, mothers and fathers are grieving today. No one is untouched by the terrible losses which have occurred over the past weeks. My friends, Phoebe and Neveen, are filled with raw, gut-wrenching grief. Grief that’ll not be assuaged anytime soon. They’ll have their own collection of memories that’ll never fade. They’ll have their own small mementos of beautiful lives they’re grieving. I’m greatly saddened for their loss. I’m greatly saddened for the tragedy occurring in Egypt. But I know with certainty that the lives lost will ever be remembered by those who loved them dearly, and by some who never even knew them. I, too, have been thinking about Egypt this past week. It’s hard not to, at least for me. So sorry for all the loss and for your losing your father at such a young age. I was 19 when my dad died. Sorry for your loss, too, Kathy. I know you’re also working through the past by writing it out. It’s so cool to receive hugs from Ecuador! I keep thinking of Pauline Hodges, my grand nephew,s wife who is a Coptic Christian. Although she grew up in the US, she has family in Egypt. So sad. Sandi, if you like pass this post on to Pauline. Such an amazing story thanks for sharing.